Durga (दुर्गा) meaning "the inaccessible" or "the invincible," is a popular fierce form of the Hindu Goddess or Devi. Durga is a manifestation of Devi and is widely worshiped as the terrible aspect of the benign goddess Parvati, daughter of the himalayas. Durga has been reverd throughout India for slaying the buffalo demon Mahishasura.The story, is a central episode of the scripture Durga Charitra . Her victory is celebrated annually in the festivals of Navratri and Durga Puja. 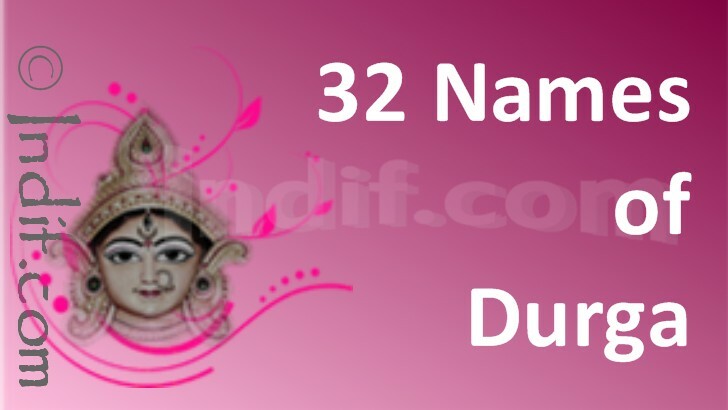 The 32 Names of Goddess Durga also known as Durga Battisi, have been provided as Durga �Dvatrinsh Naammala� in the spiritual book �Durga Saptasati�. It is also popularly known as Durga Battish Naam in Hindi. 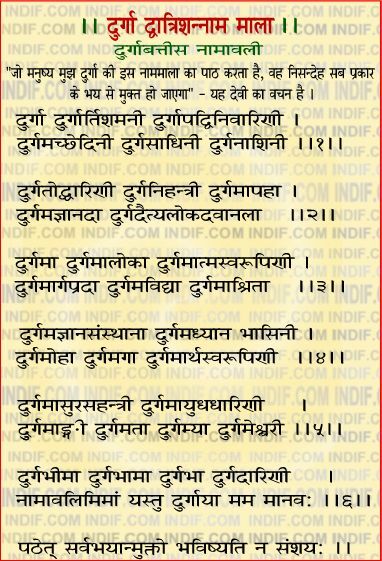 These names of Ma Durga are recited to bring an end to all difficulties in one�s life and are the reliever of all kinds of difficulties. The chant of 32 names is immeasurably powerful and anybody who sings it regularly can obtain immense benefit throughout his life as this is an blessing of the Goddess that brings difficulties to peace.